I am wandering if anybody tried to use 3D printer for PCB prototyping.. I imagine the first layer of filament could be used as etch-resist. The replacement of print head with some sort of pen assembly (Rotring drafting pen holder for example? or permanent marker?) may be the better option. My question is, how to convert gerber files into stl and useable g-code? but seems like a plausible idea.. you just won't be likely to find an answer here. Many PCB files use a format called gerber files. That is the format you will need to convert to gcode. I wonder if you could just print the gerber layer and have a way to scan that and convert it to gcode. I've seen people take family pictures and scan these and convert it to a 3d printer file and print it. If they can do it, there must be a way to convert images of the printed gerber files to a printable gcode file. I found this article about the issue... a bit complicated, still it may be the way to go. Think the problem is not the data conversion, there are many tools available. The problem is that filament will not stick reliable on the copper side of PCB . Result will be underetching . Better way to make pcb on a printer is to work with a blue laser to expose the tracks. i also had good result by making a needle from old tungsten drill , mounting it in a selfmade spring loaded holder. covering pcb copper just with some spray paint (harden paint 24h) and scratching the tracks on homemade cnc. in the past i used an old Graphtec Penplotter but unfortunately the etch resistant ink i used is no more available. Yes, I think I saw that scratching needle and spring loaded holder somewhere on web, I liked the idea, it is a good way to go from Gerber to isolated tracks on PCB. Originally I wanted to end up with HPGL code (I have two plotters lying around and doing nothing recently). Well, this is a problem... I haven't seen such converter and I did search a lot. once imported eagles cam processor should be able to generate hpgl , gcode etc. 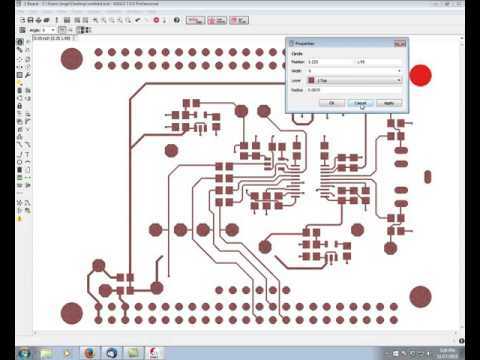 Why not choose a PCB house for pcb prototyping which would be very easy and low cost?